Upload your highest resolution page images and Juxta Editions will display them in a deep zoom window. 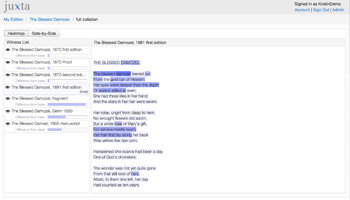 You can transcribe and mark up features of the text using the standardized vocabulary of the Text Encoding Initiative (TEI). 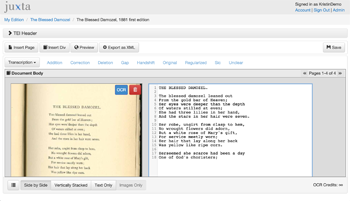 Generate diplomatic transcriptions of manuscripts, mark names and dates, and structural features. 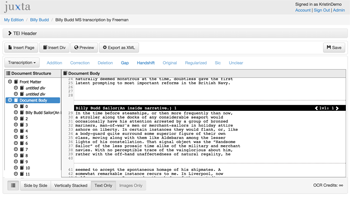 Use Optical Character Recognition (OCR) to automatically transcribe printed text. 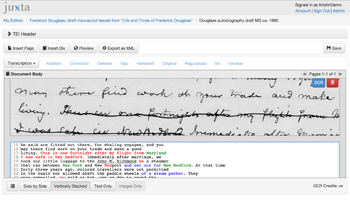 Compare your transcribed texts with versions from other sources. 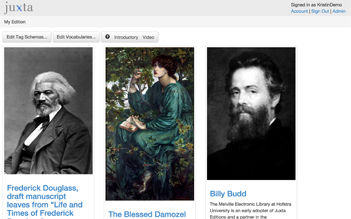 Uncover new facts about the life of the text and its history. Display texts side by side or overlay the differences on a base text. Questions, comments, inquiries, please contact us: juxta@performantsoftware.com.